After three weeks of racing headlong from one disaster to another things seem to be settling down a tad. With my pushbike being stolen off the roof while moored near Stamp End Lock I had decided to move out of harms way. Taking life steady through the Glory Hole the boat engine started to lose revs. I throttled back and made it into Brayford Pool. I tried to speed up again when I reached the open water and the same thing happened. Limped into the 24 hour visitor mooring outside the University. I carried out the usual checks. 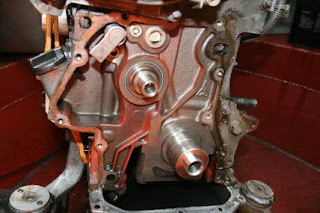 Its the engine getting air, derv and cooling with plenty of oil. A check with Alan, the previous owner, came up with a couple of items to check. Was there enough air going through the engine heat exchanger? Tighten the fan belt. Could the oil filter be blocked? Do an oil change. Plenty of derv getting through. The following night the motor bike is stolen off the bows of the bow in the early hours of the morning. A cruiser was moored within feet of the bike and they heard nothing. Nothing has been heard or seen of the bike since. Mummy says that you have had your motorbike stolen. Yes it was taken the other night. I never liked you riding it anyway. I hope you're not getting another. Collapse of stout party in fits of laughter. After words with other boaters I came across Bob the mechanic. 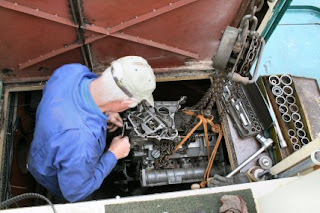 We found that we would have to move the engine to get at the workings. 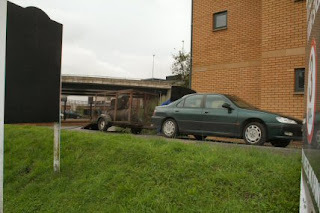 Engine moved and a large bolt at the front was found to be well and truly unmovable. Bob arrives with a large compressor and an airgun that will shift anything. 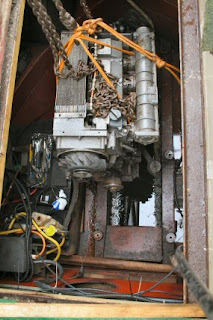 With the bolt removed the front cover comes off and the gubbins are exposed. The cover holds the governor and other bits and pieces. These Bob has taken away to check out with the workshop. As there seems to be little obviously wrong we are taking the opportunity to to change all the belts, seals and filters.